If you read this site you are more than likely familiar with Arduino and the Arduino IDE. If not let me briefly bring you up to speed. PIC32 Based Arduino Compatible Dev Board Released by Digilent Inc and Microchip. Earlier this week we were contacted by Microchip PR asking if we would like to check out a new Arduino compatible board based around the PIC32. We of course replied with a yes. We should have our sample here in the lab within a week. Microchip teamed up with Digilent Inc. to design and distribute the board, and today Digilent Inc released the chipKIT Max32™ Arduino-Compatible Prototyping Platform. Keep reading after the jump for a quick overview and a photo. Read more about PIC32 Based Arduino Compatible Dev Board Released by Digilent Inc and Microchip. DIY Adjustable Benchtop Power Supply from a common PC Power Supply? Will Lyon has got you covered. A friend of mine Will Lyon ( AKA SXRguyinMA ) has just completed his latest project which he dubbed Powerhouse. Having fallen in love with custom electronics and actually deciding to go back to college and get a degree in the feild, Will realized he would need a benchtop PSU so he could test his work. Being an accomplished PC modder and Dedicated DIYer, he decided to build his own based on an every day common PC PSU. After some planning Will decided to incorporate a Digital Multimeter, Adjustable 1.3v-30v adjustable source, and dedicated 3.3v, 5v, and 12v rails. If that was not enough, he decided to incorporate some LEDs to give it that PC Case Modder feel! We tip our hat to Will on this one. It's truly a functional work of art! Check out Proect Power House's full build log over on TheBestCaseScenario.com. We have a few photos after the jump for those of you who want instant gratification. Read more about DIY Adjustable Benchtop Power Supply from a common PC Power Supply? Will Lyon has got you covered. LaunchPad: Q&A session with MSP430 product marketing manager, Adrian Fernandez. Following up on our post about Texas Instrument’s new development platform LaunchPad, we sent some questions to TI Media Relations about some concerns members of the community have expressed. MSP430 product marketing manager, Adrian Fernandez was kind enough to answer the questions for us. So without further delay let’s get on to the answers. Read more about LaunchPad: Q&A session with MSP430 product marketing manager, Adrian Fernandez. Texas Instruments rockets into the hobbiest community with LaunchPad. Last week Texas Instruments debuted its hobbiest level Micro Conroller dev board named LaunchPad. Hack A Day posted a very thurough introduction but we wanted a little more information. Texas Instruments is selling the full kit including 2 micro controllers for just $4.30 and is shipping them for free. So what exactaly is Launchpad and what can it do? We cover that after the jump. 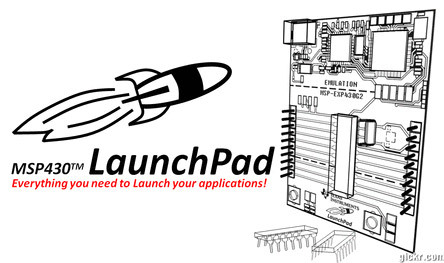 Read more about Texas Instruments rockets into the hobbiest community with LaunchPad.